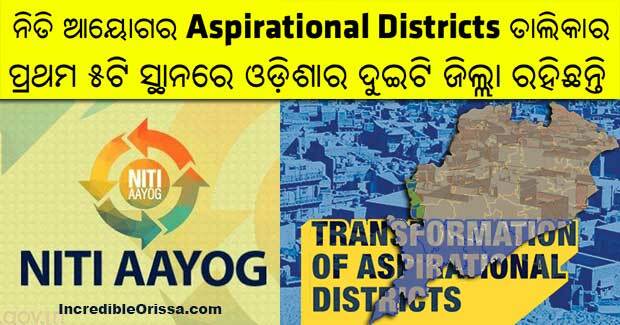 Two districts of Odisha have been placed among the top five most improved districts of India, as per the Second Delta ranking for the Aspirational Districts released by the NITI Aayog. Virudhunagar district in Tamil Nadu showed the most overall improvement followed by Nuapada in Odisha, Siddarthnagar in Uttar Pradesh, Aurangabad in Bihar and Koraput in Odisha. The rankings of the two districts are also same in the ‘Improvement in Basic Infrastructure’ category. Nuapada is also at the second position in ‘Improvement in Education’ category. In the ‘Improvement in Agriculture & Water Resources’ category, Gajapati district has been ranked second. Similarly, Rayagada district has been placed at the fourth spot in ‘Improvement in Skill Development’ category. The delta ranking measured the incremental progress made by 111 aspirational districts between June 1 and October 31 across six developmental areas – health and nutrition, education, agriculture and water resources, financial inclusion, skill development and basic infrastructure. The Aspirational District Programme was launched by Prime Minister Narendra Modi in January this year with an aim to rapidly transform the districts that have shown relatively lesser progress in key social areas.